Google Docs lets you pick Image Search results and add them to your documents. That’s a good thing, but this feature could have been better thought out. Google restricts the results to images licensed as Creative Commons that can be used commercially and that can also be modified. These restrictions aren’t always necessary, since not all documents are used for business purposes. Google also recommends to “only select images that you have confirmed that you have the license to use”, but it doesn’t link to the pages that included the images. Google doesn’t even include a small caption next to the image with links to the Creative Commons license and the original web page. While this feature makes it easy to add image search results to your documents, it doesn’t encourage users to visit the web pages that embedded the images or to give credit to the image creators because it’s quite difficult to find these pages. 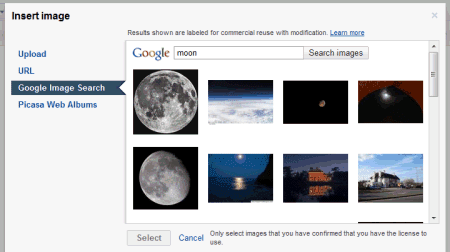 You need to visit Google Image Search, type your query, restrict the results to images “labeled for commercial reuse with modification” and find the image you’ve previously picked. That’s a lot of unnecessary work.